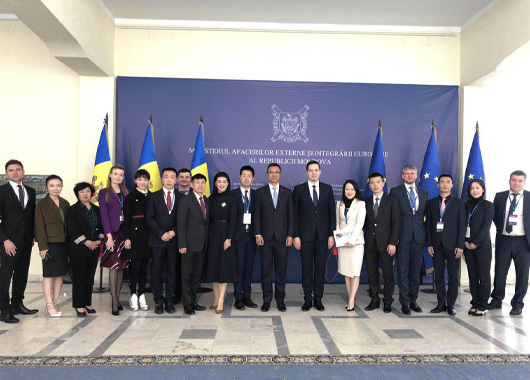 On Tuesday 3 April, Ivan Hiel, President of The Anchor Group, Davy Wauters, Government Relations and Ivan Kamenchuk, Business Development Anchor Ukraine joined an official Chinese delegation of CEATEC on a two day visit to Moldova. The delegation was received by the Prime Minister of Moldova as well as the Moldovan Minister of Commerce and Trade, the Moldovan Minister of Foreign Affairs and European Integration and the Moldovan Minister of Infrastructure. The visit was organised and hosted by the Moldovan Agency for Investment and Trade with the aim of presenting the Republic of Moldova to Chinese businesses and to promote trade between both countries and attract investments to Moldova. On Wednesday 4 April, a Business Forum and a B2B Networking Event was held, attended by more than 100 Moldovan enterprises. The visit concluded with a traditional Moldovan dinner and wine degustation served in the famous lime stone cave wine cellar of Cricova. The Anchor Group, as a strategic partner of CEATEC, serves as a bridge and facilitator for Moldovan companies wanting to trade with China and for Chinese companies to trade in Moldova.